Gilching (Germany), March 7, 2019 – The pro-beam Group, one of the world’s leading companies in the area of electron beam technology, is the first company to have executed welding tasks in the e-mobility sector using electron beam technology. The company has further developed its systems and is now in the position to weld delicate copper hairpins for electric drives as well as battery casings in a quick, safe, and high-quality manner – both pore- and splatter-free. This makes the Group an industry pioneer. Short cycle times, a high level of automation, and a low scrap rate are significant factors in the automotive industry. In the manufacturing of components for the chassis, transmission or engine using pro-beam’s electron beam process, OEMs and suppliers are already benefiting from easy automation, high productivity, and comprehensive monitoring of all process parameters. In addition, the electron beam offers the ideal prerequisites for conductive metals such as copper and nickel, or lightweight metals such as aluminum and aluminum alloys. 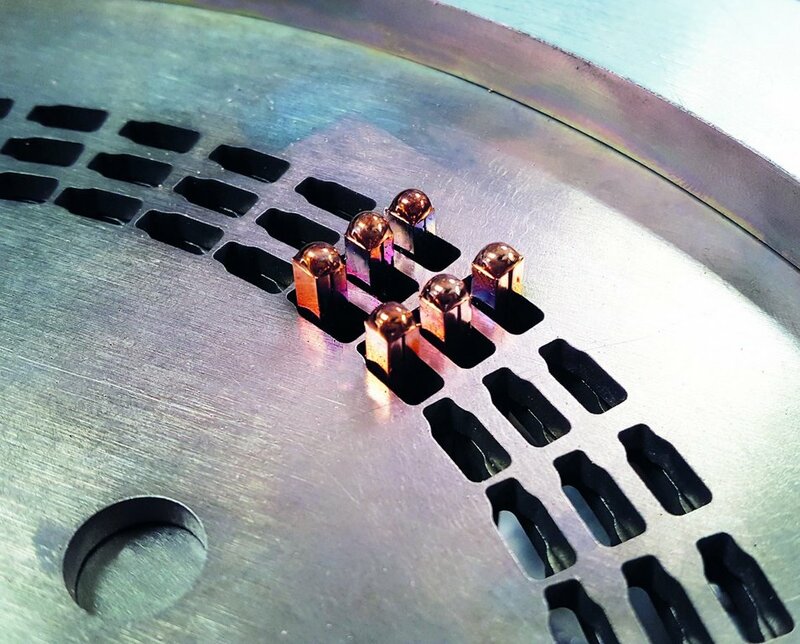 For the first time, the pro-beam Group has made it possible to further develop its electron beam systems for the welding of battery casings as well as delicate copper hairpins, as they occur in stators of electric drives. As opposed to other beam-processing types, the electron beam welding does not result in any optical effects, such as reflections. This method is therefore particularly suited for the joining of copper joints. Within the scope of the welding process, the EB technology acts as an efficient and economical tool, not least because, due to the multi-beam technology, six pairs of hairpins can be joined simultaneously. The jump between the pins transpires so quickly that the molten metal does not have an opportunity to cool, and the deep-welding effect is retained. Beyond this, the electron beam welds quickly, safely, and in a high quality manner – pore- and splatter-free. Furthermore, the high degree of the systems’ digitization enables an excellent reproducibility of the process. On the one hand, this is ensured through the automated beam adjustment and the automated joint recognition system. On the other, by the automated welding as well as an automated quality control that is based on numerous parameters recorded during welding. Moreover, the entire process can also be monitored precisely and integrated into a networked production environment. “When welding hairpins, the efficiency of the motors, which is equivalent to the range of the vehicles, is of primary importance. The quality of the weld joints therefore plays an important role, meaning working in a vacuum is highly recommended. It’s a process that is just as uncomplicated as the vacuum-drying process known in the automotive industry. Intelligent sluice concepts thereby prevent that the creation of the vacuum has a negative effect on the production time,” explains Dr. Thorsten Löwer, CTO at the pro-beam Group. For decades, the electron beam has been well-loved in the aeronautics and space industries, in major research projects, and in the automotive industry. “Our process also has great potential for the electric mobility market and going beyond that, too. In contrast to an electric arc, the task of an electron beam always determines the process – therefore, the possible welding tasks are highly varied,” notes Dr. Thorsten Löwer. The electron beam also welds multiple mixed compounds and achieves welding depths of up to 150 mm. It is able to weld sintered metals and align height offsets. In order to achieve the level of automation required by customers, pro-beam’s electron beam systems are entirely digitized and utilize a self-developed control concept that operates similarly to a CNC-controlled machine. The pro-beam Group is the global leader in the electron beam and laser technology sector. pro-beam provides services and systems for the welding, curing, perforating, and coating of surfaces. Customers from over 40 countries have been trusting pro-beam solutions for over 45 years. The global company is represented by five locations and more than 350 employees. The company headquarters is located in Gilching, near Munich. More information about pro-beam is available at: www.pro-beam.com.